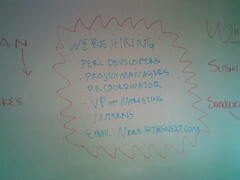 Lunch 2.0 in Santa Monica – They’re hiring! I spent lunch today doing Lunch 2.0 down at the Santa Monica offices of ThisNext, our hosts. I met a lot of great people, working on a lot of great projects. In fact, it seemed a lot of people, including ThisNext were looking for staff. You can click through on this shot of their office white board to see who they are looking for and who to contact with your info. I look forward to more Lunch 2.0 meetings in the future.